Captain Jintu was born in Khumtai a small town in Golaghat district of Assam. Son of, Hon Fg Offr Thogiram, an IAF veteran and Duluprabha , Capt Gogoi had a sister, Luna. Capt Jintu Gogoi was commissioned into 17 Garhwal of the Garhwal Rifles one of the most decorated regiments of Indian Army. During 1999, his unit was deployed in J & K area and when the Kargil war broke out, he was recalled from leave to join his unit just 12 days after his engagement. Capt Gogoi was an inspiration to the people of the entire state, specially the younger generation. 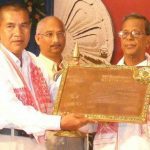 The state of Assam was going through turbulent times during the Kargil war as the Ulfa had given an open call to the people of the state to back the Kargil intruders. 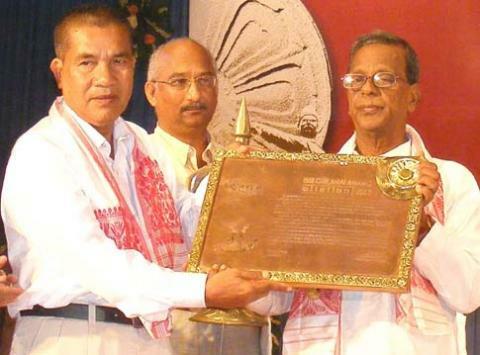 The presence of Jintu and his inspirational words made the people of Assam to back him and India. 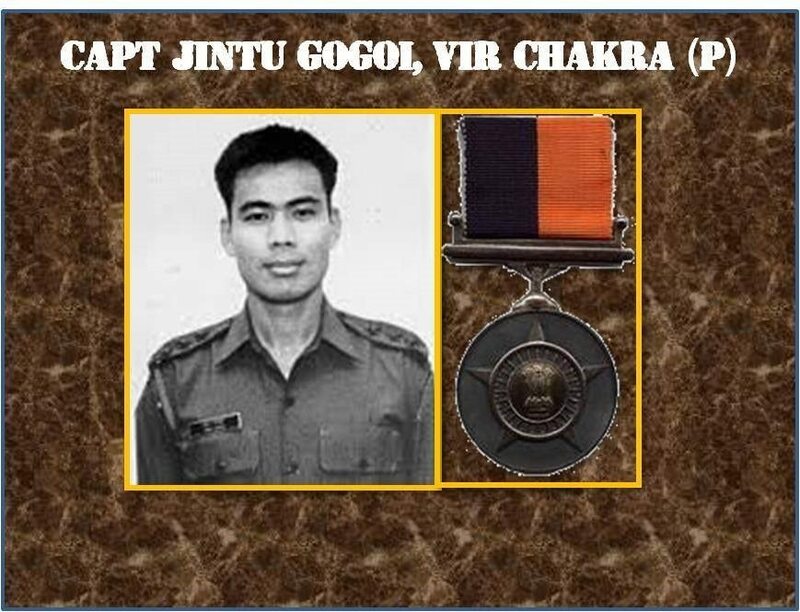 Capt Gogoi was awarded the Vir Chakra on 15 August 1999 for the courage, he displayed while leading his troops to evict the enemy from Kala Pathar in the Batalik sector. 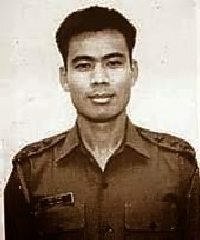 On the night of 29th June, Capt Gogoi and his troops were given a mission to clear the enemy from Kala Pathar in the Jubar heights, a ridge-line overlooking Jubar top, astride the National Highway connecting Srinagar and Leh. This area was near the line of control in the Batalik region. Capt Jintu Gagoi took charge of the mission and set course towards the objective that entailed an arduous climb. L/NK Madan Singh, Rfn Jaideep Singh, Rfn Varinder Lal (17 Garhwal), Sep Rajvir Singh, Sep Dharambir Singh, Sep Vinod Kumar, Sub Harphul Singh, Sep Gazpal Singh and Sep Krishan Kumar (17 JAT) also accompanied Capt Jintu Gogoi. Capt Gogoi led his troops to the top of the ridge, however, they were spotted by the enemy and were surrounded from all directions. On being asked to surrender Capt Gogoi living up to the motto of his Regiment , “Yudhaya Krit Nischya(Fight With Determination)”, charged at the enemy troops with the his Regimental war cry , “Badri Vishal Lal Ki Jai (Victory to the Sons of Lord Badri Nath)”. 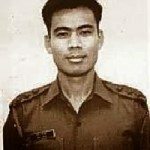 Capt Gogoi in a daring action killed two enemy soldiers but also got injured during the exchange of fire. He received a full burst from a machine gun in his solar plexus but he continued firing till he collapsed. He later succumbed to injuries and his body was found barely 150 yards from the picket on Jubar Top. 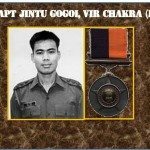 Capt Jintu Gogoi was given the gallantry award, “Vir Chakra posthumously for his bravery in utter disregard for his own safety. The battalion launched fresh attacks in the subsequent days and took Kalapathar. This paved the way for further successes – the battalion proceeded to take another dominating feature in the Muntho Dhalo complex, finally taking Point 5285 despite heavy snowfall and effective enemy fire. The battalion was later awarded the Battle Honour ‘Batalik’ for its exploits in Op Vijay. Khumtai, a nondescript township in Golaghat district, has become a pilgrimage site after Capt Jintu’s “sacrifice” and people from far off places in the state visit the small house of the Gogois to pay their respects to the brave son of the soil. On the night of 29/30 June 1999 during “Operation Vijay”, Captain Jintu Gogoi was tasked to evict the enemy from ridge line Kala Pathar near the Line of control in general area of Juber Hill complex in Batalik sub-sector. With utter disregard to his personal safety, he led the troops in the face of heavy enemy fire and reached the top by first light. However, he was immediately surrounded by the enemy and was asked to surrender. As he had no chance to protect himself, he chose the honorable way of fighting with valour and dignity. He opened fire on the enemy killing two enemy soldiers before making the supreme sacrifice. Before this action, he made sure that his group had taken cover for safety. When the mortal remains of Capt Gogoi arrived in his hometown, every inch of space on either side of the road from Jorhat airport to Khumtai in Golaghat was packed with people shouting “long live Jintu Gogoi”. A memorial complex has been built at Khumtai which displays all his personal belongings including his books, army uniform and photographs. It has a small museum which displays all of his belongings. It describes the life and work of the martyr. The government of Assam has allotted an LPG Distribution agency to the family of Capt. Jintu Gogoi. On 19th December 2015,Captain Jintu Gogoi, VrC Memorial Football Tournament was organised by ‘Dao Division’ in association with Dibrugarh District Sports Association (DDSA) as a mark of respect to Kargil Martyr and to promote a spirit of ‘Good Will’ among the local population. A few unsaid decision,An unusual chemistry. StiLL & wiLL miSs uhh foReVer bro ..